We will start the application, and create a basic map to use for examples and exercises. The goal for this lesson: To get started with an example map. Before starting this exercise, QGIS must be installed on your computer. Also, you should have downloaded the sample data to use. Launch QGIS from its desktop shortcut, menu item, etc., depending on how you configured its installation. The screenshots for this course were taken in QGIS 3.4 running on Linux. Depending on your setup, the screens you encounter may well appear somewhat different. However, all the same buttons will still be available, and the instructions will work on any OS. You will need QGIS 3.4 (the latest version at time of writing) to use this course. Open QGIS. You will have a new, blank map. Click the Open Data Source Manager button: . If you can’t find the icon, check that the Data Source Manager toolbar is enabled in the View ‣ Toolbars menu. Click on the Vector tab, enable the File source type and press the … button next to Vector Dataset(s). Navigate to the file exercise_data/shapefile/protected_areas.shp (in your course directory). Select the file and click Open. You will see the original dialog, but with the file path filled in. Click Add here as well. The data you specified will now load. Congratulations! You now have a basic map. Now would be a good time to save your work. Save the map under a solution folder next to exercise_data and call it basic_map.qgs. Repeat the steps above to add the places.shp and rivers.shp data sets from the same folder (exercise_data/shapefile) to the map. You’ve learned how to add a layer and create a basic map! Now you’re familiar with the basic function of the Open Data Source Manager button, but what about all the others? How does this interface work? 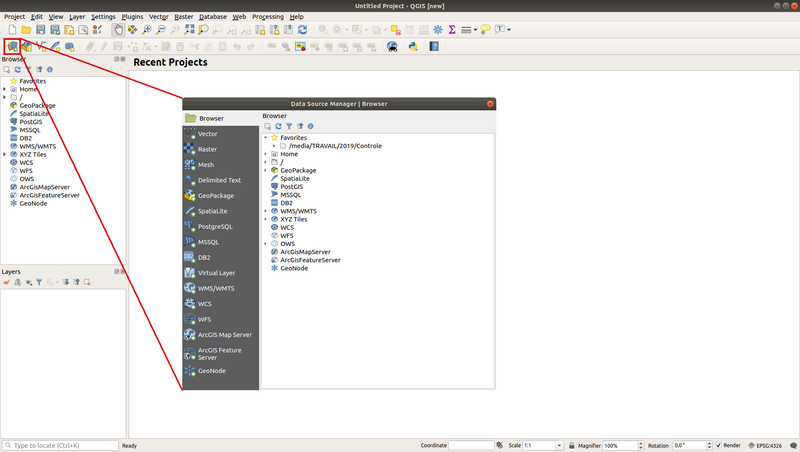 Before we go on, let’s first take a look at the layout of the QGIS interface. This is the topic of the next lesson.